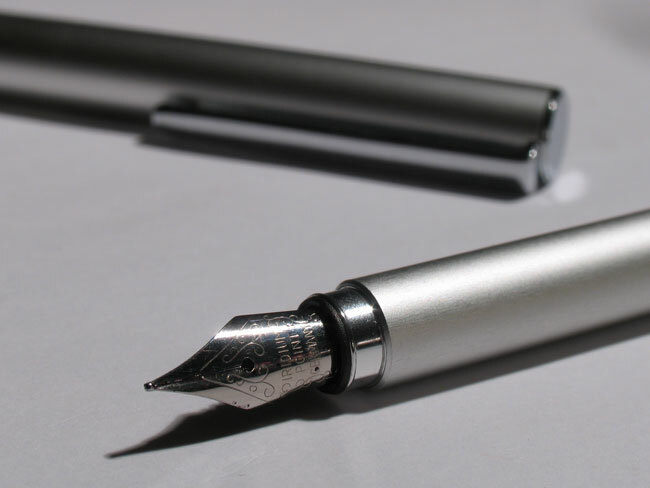 This is Part 4 in a series of fountain pen reviews. Be sure to read Parts 1, 2, and 3. Not long ago I discovered a Web site called Jet Pens. They are an importer of all manner of cool Japanese pens and pencils that can’t readily be found in the states. I was drawn in by a number of their offerings and after a few weeks of visiting and drooling I finally broke down and ordered a few things: two compact fountain pens and some colored pencil lead. The Ohto Tasche, a very stylish compact, cleverly designed little pen. It measures a mere 3 3/4″ when closed but a nice 5 3/4″ with the cap posted. It achieves this because the cap is nearly as long as the body of the pen. The Tasche comes in four different colors and is also available as a pencil and ball point. I opted for the silver body because I thought it looked a bit classier. 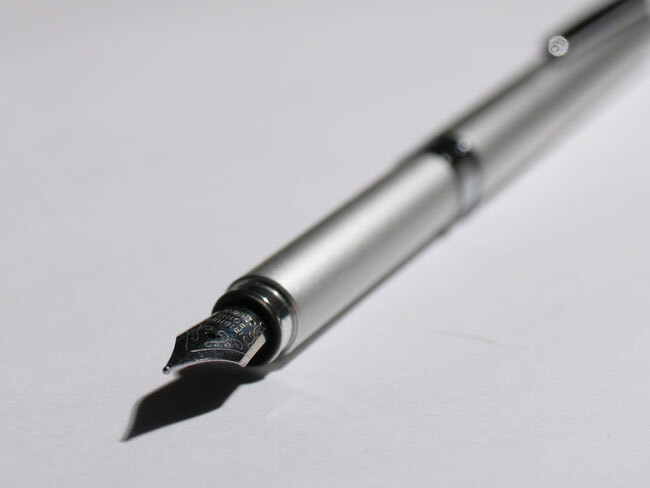 The pen is only offered in one nib size which I would rate somewhere between a fine and a medium and takes only small international cartridges. When I first tried out the pen I found the ink flow to be spotty. It was slow to start and skipped quite a bit, but after I swapped out the included cartridge for one of my own the problem was solved. Now it writes smoothly and rarely skips, but because of it’s compact size it can cause my hand to cramp up a bit during extended writing. But as I don’t do a lot of that it’s not a huge concern. 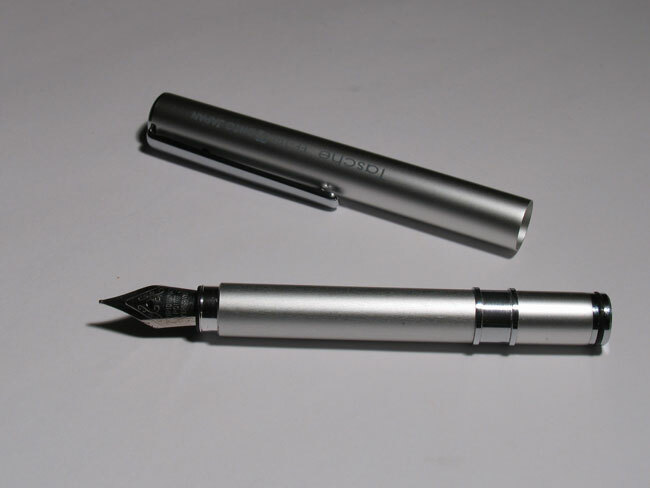 For $20 it’s not a bad pen, and because of it’s handy compact size, it’s one I carry around in my pocket a lot. Hey, another JetPens customer, and appreciator of fine-tipped pens. You might try the “disposable” Petit1s FP… they’re about as skinny as the Heros, and a bit more solid, despite the fact that they’re made of plastic. Skinnier than the OHTO too. I love the Kinokuniya in SODO too. I actually have a Pettit1 that I purchased at the same time as the Tasche. I plan to do a review of that one a bit later. Thanks for reading and the suggestion. What cartridge does the OHTO take?